Since its inception in 2004, Celtic Woman has emerged as both a spectacular commercial success and a genuine cultural phenomenon. The group's uplifting mix of timeless tradition and contemporary craft has transcended national and cultural borders to touch the hearts of a loyal international fan base, who've embraced Celtic Woman's hugely successful public television specials and made their eight CDs and seven DVDs into multi-platinum best-sellers. As a live act, they continue to sell out concert halls around the world, having performed for nearly three million fans. Celtic Woman will release a brand-new album and DVD on February 25, 2014 titled EMERALD: MUSICAL GEMS that spotlights newly reimagined performances of fan favorites from the group’s treasure chest of Celtic songs. 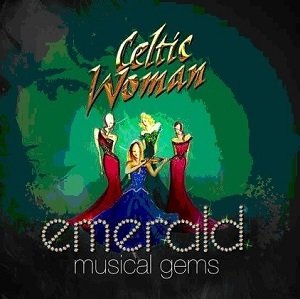 A celebration of the Emerald Isles’ rich musical heritage, EMERALD: MUSICAL GEMS includes the uplifting “Mo Ghile Mear” and “Dulaman”, the enchanting “She Moves Thru the Fair” and “Caledonia” and the ever-haunting “Danny Boy” and “The Voice”. Also featured are new interpretations of Celtic Woman’s inspiring performances of the beloved “Amazing Grace” and “You Raise Me Up”. The companion DVD, EMERALD: Musical Gems - Live in Concert, was filmed this year USA, where it dazzled the family-friendly audience with a one-of-a-kind interactive concert experience that showcased the group’s sparkling pure voices, bewitching choreography and fairytale charms along with the talents of a group of world-class musicians, an Aontas Choir, bagpipers and championship Irish dancers.